A new ish product to me is eye patches. I’ve seen these online before but I’ve never tried them to recently. 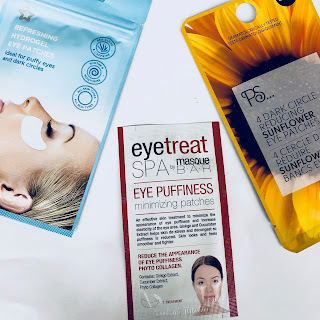 I’ve seen affordable ones such a the primark ones (which I’m reviewing in a post stay tuned) Superdrug’s own and Masque Bar Eye Repair! These really interest me. Basically, these eye patches are made for different reasons, some are for anti wrinkles, some are hydration and moisture, some are for brightening and some are for unti puffiness. They’re like little facemasks for your eyes that are made to fit perfectly under the eyes in a gel like puff. They’re like an extra step of self care that is not needed but just nice to do in your skincare routine and with the fact that the skin under your eye shows the first sign of ageing, is extremely delicate & can make you look older with puffiness, fine lines and fullness. Overall, I do think these are worth the hype and I do think they are a little extra self care product I think everyone should use because they are lovely & relaxing!